Local legend has it that Buddha once visited Mandalay Hill and foretold that a great Buddhist city would be built at the base of the hill in the Buddhist year 2400. Mandalay and surrounding towns are known for the hundreds of pagodas and monasteries found in the area. Mandalay, founded in 1857 is a relatively new city; the ancient capitals Sagaing, Inwa and Amarapura around Mandalay are much older. Mandalay was the capital of Burma during the Konbaung era from 1859 until 1885 when Mandalay was brought under British rule. It is indeed the cultural and Buddhist centre of Myanmar (formerly Burma). I was leading a group of 14 friends to Myanmar. It was a 10-day trip and the plan was to explore Mandalay, Bagan, Inle Lake and Yangon. We landed at Mandalay international airport at around 2:30 in the afternoon. It was a 90-minute flight from Bangkok. And Bangkok was a 4 hour flight from Mumbai, India our departing point. For our trip, we were in good hands of Peak DMC, a destination management company. As always, they were well-informed with a dedicated team and guide at all our destinations. Their local Mandalay representative welcomed us at the airport. At our disposal was a comfortable 20-seater bus. Talking of vehicles, it was interesting to see that most of the vehicles had their steering wheels on the right side (British Colonial days; driving on the left side of the road) but drove on the right side, the European way - after getting their independence from the communist regime! Only the newer vehicles come with steering wheels on the left side, the way it should be. We drove to our resort, Rupar Mandalar, which was just on the outskirts of Mandalay. It took us almost an hour to reach our hotel. Not that, it was far, but our bus driver was extremely slow. In fact, all buses are advised to drive slowly and carefully. No complaints here. Rupar Mandalar Resort is lovely place to spend a few days. 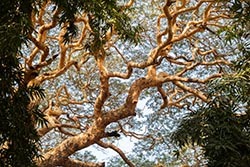 Lavishly built with liberal use of teak wood (Burma, of course) and sprawling landscapes surely urged us to spend us rest of our day relaxing and soaking in the rejuvenating atmosphere. Dinner that night was at the hotel itself. Post breakfast the next morning our first stop was Mahagandhayan Monastery in Amarapura about 20 kms from Mandalay. We planned to watch the monastery's daily ritual of monks having their lunch! This ritual at Mahagandhayan Monastery has definitely made it onto the tourist circuit. And attracting the tourists are the painted faces of locals. Using ground paste made from the barks of Thanaka tree, this is a very popular and local treatment for keeping the skin soft and smooth. All across the country one can see almost every women apply the paste on their faces. They even draw different patterns. The Mahagandhayan monastery is a peaceful and spiritual place and it�s tradition that all Burmese men will be a novice monk for one week during their childhood and again in later life for a year. 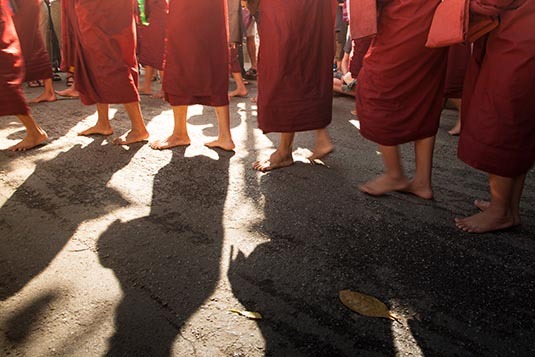 The monks dressed in dark red robes wake up at 5 am to perform their lessons and daily duties. Lunch is served at 10:30 am and is a daily ritual where all of the monks form a line and slowly enter the dining area where they receive their food and sit in one of the dining halls. The food is donated by local people who also organises for it to be cooked in huge pots over wood fires. 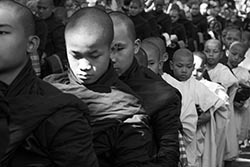 Up to 1500 monks will eat together. Very near from the monastery is the famous U Bein Bridge. It's a crossing that spans the Taungthaman Lake near Amarapura. The 1.2-kilometre bridge was built around 1850 and is believed to be the oldest and longest teakwood bridge in the world. Construction began when the capital of Ava Kingdom moved to Amarapura, and the bridge is named after the mayor who had it built. It is used as an important passageway for the local people and has also become a tourist attraction and therefore a significant source of income for souvenir sellers. It is particularly busy during July and August when the lake is at its highest. 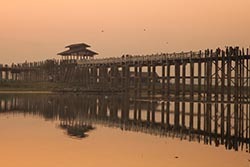 The bridge was built from wood reclaimed from the former royal palace in Inwa. It features 1086 pillars that stretch out of the water, some of which have been replaced with concrete. Though the bridge largely remains intact, there are fears that an increasing number of the pillars are becoming dangerously decayed. Some have become entirely detached from their bases and only remain in place because of the lateral bars holding them together. Damage to these supports have been caused by flooding as well as a fish breeding program introduced into the lake which has caused the water to become stagnant. It was noon when we were at the bridge. Of course, that's a bad time to enjoy the beauty of the bridge and the lake around. Few of from the group decided to come early next morning to witness the sunrise. And that's my suggestion to readers - be at the U Bein Bridge either at sunrise or sunset. The pictures will tell you why? Our next stop was Mahamuni Temple. 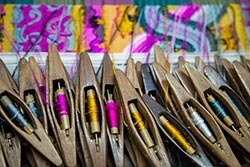 Enroute we made a quick stop at a silk-weaving factory and then to a wood carving workshop. Myanmar is famous for both of these arts. A few from the group made a few souvenir purchases. The Mahamuni Pagoda or Mahamuni Buddha temple is one of the most important Buddhist pilgrimage sites in Myanmar. The temple houses the Mahamuni Buddha image, the most highly revered Buddha image in the country. The pagoda was built in 1785 by King Bodawpaya of the Konbaung dynasty after the Mahamuni image was captured during the invasion of the Arakan Kingdom. The Mahamuni museum on the temple grounds tells about the history of Buddhism. The museum displays information about the various places in the life of the Buddha, from His birth place in Nepal, the site where He reached enlightenment and the site of His passing into final Nirvana. There are also maps that explain about the spread of Buddhism across Asia during the last 25 centuries. The Mahamuni, which means the Great Image is seated on a very ornate 1.80 meters high pedestal. The image in the Bhumisparsha Mudra posture is 3.80 meters high and weighs about 6 tons. 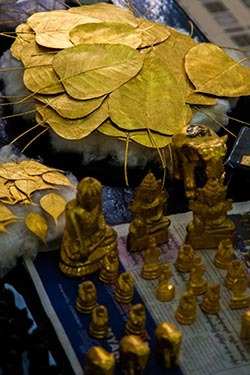 To pay respect to the Buddha image, male devotees apply gold leaf to the image, which is called shwe cha in Burmese. 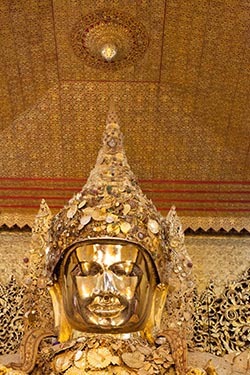 As a result, the Mahamuni Buddha is covered with a thick layer of gold leaf of about 15 centimeters, which has distorted the shape of the image. Several old photos of the image in the temple show the difference in the outline of the image between a century ago and now. Next we visited the Royal Palace, stopping enroute for a while at a gold leaf making workshop. The Royal Palace in Mandalay was the last Palace built by the Burmese Royals. When King Mindon Min founded Mandalay in 1857 he ordered construction of a new Royal Palace called the Mya Nan San Kyaw. The old Royal Palace in the former capital Amarapura was dismantled, transported to Mandalay and rebuilt there. On the large complex are dozens of buildings including audience halls, throne halls, a monastery, a watch tower, a court building, a tooth relic building and a library where the Buddhist scriptures were kept. The Palace that was completely made from teak wood was built in the center of a large citadel or fort. The square citadel was surrounded by four walls each 2 kilometers long with a total of 48 turrets. In the walls were 12 gates, one for each sign of the Zodiac. Around the walls was a 60 meter wide moat, crossed by a number of bridges. In 1885 during the reign of King Thibaw Min the British took Mandalay ending the Konbaung dynasty. The Palace was looted and converted into a fort for the British army. During the Second World War the Royal Palace was destroyed by fire after a bombing raid. The only two original buildings that survived were the royal mint and the watch tower. During the 1990�s the Palace was rebuilt following the original design but partly using modern materials. Inside the Palace there are some artifacts on display in glass showcases and several reproductions of thrones. Much of the original artifacts that were in the Palace at the end of the 19th century are still on display in a British museum. Several rooms of the Palace display life size statues of King Mindon Min and his successor King Thibaw Min, the last Burmese King. 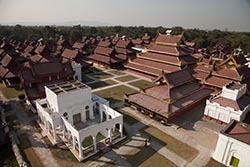 Today part of the citadel complex is used by the Burmese army, the Palace and surrounding gardens are open to the public. Our next stop, the Kuthodaw Pagoda comprises of a gilded pagoda, hundreds of shrines housing inscribed marble slabs and several pavilions. The pagoda is also called �the world�s largest book�, named after the 729 marble slabs inscribed with Buddhist teachings. The Kuthodaw Paya or �Royal merit pagoda� was built by King Mindon Min at the same time the nearby Royal Palace was built. Construction started shortly after the founding of Mandalay in 1857. The King built the Kuthodaw to leave a great work of merit for future generations. 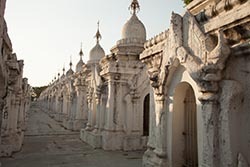 The Kuthodaw pagoda resembles the nearby Sandamuni pagoda that also features a large zedi and hundreds of inscribed marble slabs, which are contained in a smaller, more compact area. The main entrance to the grounds is the ornate, gold and red South gate which is adorned with sculptings of deities and animals from Buddhist and Hindu mythology. The gate is topped with several multi-tiered Pyatthat roofs. From there, a long covered corridor leads to the stupa at the center of the grounds. Mural paintings from the late Konbaung period (second half of the 19th century) adorn its walls. At the end of the corridor is a pavilion enshrining an image of the Buddha. Surrounding the pagoda are 729 shrines each containing a single marble slab inscribed in both sides in Burmese script. Together, the 729 slabs are called �the world�s largest book�, each stone slab representing one of its pages. The slabs are inscribed with texts of the Sutta Pitaka, the Vinaya Pitaka and Abhidhamma Pitaka, the three parts that make up the Tripitaka, the teachings of the Buddha written in ancient Pali language. King Mindon ordered the �book� to be made. The works started in 1860 and took 8 years to complete. The texts were copied from ancient manuscripts written on dried palm leaf, the letters chiseled out of the stone and inlaid with gold leaf. Each marble slab measuring 153 centimeters tall and 107 centimeters wide is enshrined in a structure called Dhamma ceti or kyauksa gu in Burmese, �gu� meaning cave. The white shrines are lined in rows around the complex, with corridors in between wide enough to walk through. Each Dhamma ceti houses a single slab behind openable gates. The shrines have an entrance on all four sides with elaborately decorated arches over them and are topped with a hti, an ornamental spire. The last activity for the day was enjoying the sunset atop Mandalay Hill. Mandalay Hill is a 240 metres (790 ft) hill that is located to the northeast of the city centre. The city took its name from the hill. 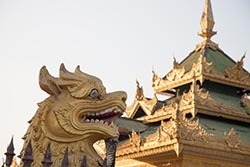 Mandalay Hill is known for its abundance of pagodas and monasteries, and has been a major pilgrimage site for Burmese Buddhists for nearly two centuries. At the top of the hill is the Sutaungpyei (literally wish-fulfilling) Pagoda. A panoramic view of Mandalay from the top of Mandalay Hill alone makes it worthwhile to attempt a climb up its stairways. The bus and private cars can drive up midway and from the parking lot paid shuttle service drive you further up. From there tourists can opt for alift up to the pagoda or take the last few steps. Unfortunately, at the time of our visit, the lift was out of bound for some VIP arrival. We mazed our way up through countless small shops selling prayer material and souvenirs. Farther up near the summit, a gigantic standing image of the Buddha called the Shweyattaw (literally standing) or Byadeippay (prophesying) Buddha with his right hand pointing towards the city. Legend has it that the Buddha once visited the place and prophesied that in the year 2400 of the Buddhist Era a great city would be built at the foot of the hill where his teachings would flourish. After enjoying the sunset and the panoramic views, it was time to indulge in some foot massage to soothe our long tiring day. Amravathi is a nice place to get a massage. Dinner that night was at an Indian restaurant. The next morning, post check-out we left for the pier for a one night cruise to Bagan on River Irrawadi. The day was spent on our boat R V Paukan enjoying the tranquility of the river and the rural life on its banks. In the late afternoon we anchored at Yandabo, a village known for its pot-making community and where the peace treaty of the Anglo-Burmese war was signed on February 24, 1826. 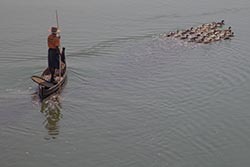 Since the 6th century the river has been used for trade and transport and today it still remains Myanmar's lifeline. At 10 the next morning we were at Bagan.